Milly really surprised me this season – I usually find her pieces too stuffy or preppy for my taste, but this time around she truly stepped out of her shell. Fun silhouettes, a plethora of fabrics and a bit of edge took control of the runway. I for one am drooling over the rain-coat-cape hybrid in the second pic… seriously the chicest rainy day accessory I have ever seen. Jenni Kayne has been a favorite of mine for the last several seasons and this one is no different. Kayne plays with a variety of colors, prints and evokes a youthful vibe in all of her pieces. Short suits are all the rage and I’m definitely eyeing the sunny yellow set above – amazing! J.Crew just keeps getting better and better. 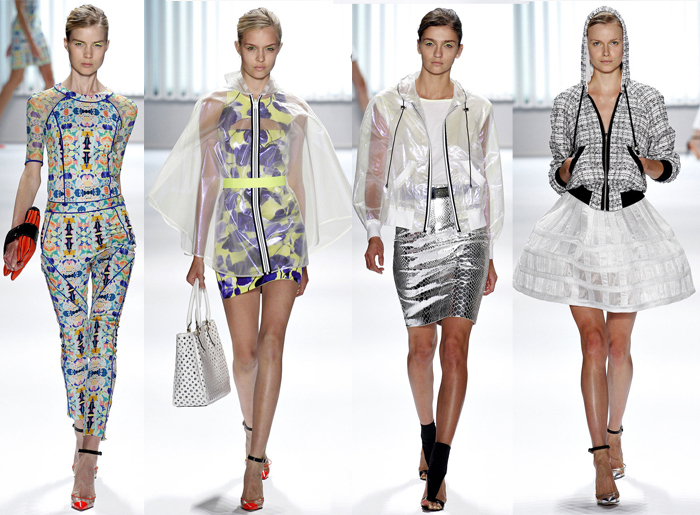 Eye-popping prints and menswear-inspired shapes are the spotlight for Spring/Summer 2013. Again, you see adorable short suits here (and hopefully for a good price)! I also am loving the pink/red/purple poncho-slash-top. Would be so cute over white jeans, cutoffs, etc. i would definitely wear the first outfit you chose by milly. can’t tell if it’s a jumpsuit or a pants/top combo, but either way i love everything about it!